The modern BMW GS is not unlike a magic carpet - almost telepathic in it’s manners. After so many generations of refinement, the chassis, motor, and suspension are nearly sublime. Yet, it is also the unique design of these components that also makes the bike heavy, unwieldy, and unable to express the classic looks and lines of the older airhead BMW's that we all seem to adore. Since the bike is considerably lighter than stock, the suspension needed some dialing in. Wilbers shocks were fitted front and rear, with custom spring rates and adjustable preload that allow for proper race sag with the radically lower weight (the bike lost 160 pounds from stock - dry weight is down to 423 from 583). Weight balance front to rear is exactly 50/50. The BMW GS has incredible brakes, and I intended to retain the braking power but lighten and simplify the system. Everything north of the brake calipers is custom, although after 86'ing the mammoth aging ABS, all discs, calipers, and pads and hardware were replaced with new OEM pieces. The levers are more minimally styled classic Brembo units originally destined for the Ducati 900 series, which has the same piston diameters as the BMW. Brake hoses are custom Goodridge plumbed, with the front receiving the twin hose connection treatment and titanium hardware. The rear brake gets the same plumbing, but with a modified Honda Racing Corporation reservoir delete kit. A slim profile custom 5-gallon fuel tank was designed in collaboration between Lawrence Au, Tim Harney and myself, to echo the old airhead toaster tank, and afterwards Harney fabricated the tank from aluminum. The knee cutouts were traced from my knees. A Monza flip-up gas cap was mounted. 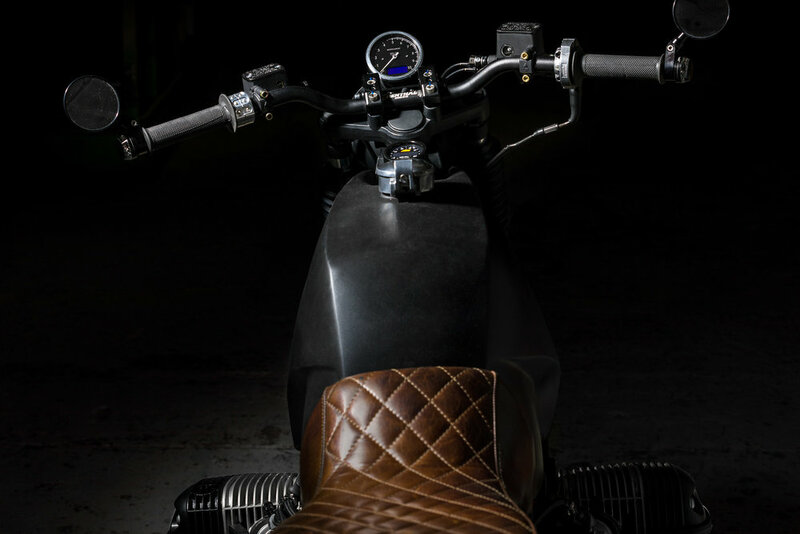 The seat was covered in luxurious heavy leather with a diamond stitch pattern by Via Meccanica after I trimmed and shaped the seat pan and foam to match the bikes new, slimmer profile. Every nut, bolt, washer, bushing, bearing, rubber and maintenance or wear item on the bike was replaced with OEM parts, and when possible upgraded (i.e., Nylock bushings in the rear swingarm). BMW purists might shriek at first glance of this sliced and diced GS, but I hope they would be won over by the traces of BMW geekiness like BMW blue torque spec marking paint on all torqued hardware, proper fenders, bright lights, a properly set-up GS suspension and even an ample removable windscreen. The bike may look like a style exercise but much care went into creating a highly practical and rideable BMW that retains some of the best features that the GS had - yet lighter, faster and with classic looks. It takes a village… Many were consulted from the Brooklyn motorcycle community, who nudged and helped during different stages of the process. I am eternally grateful for all their help. 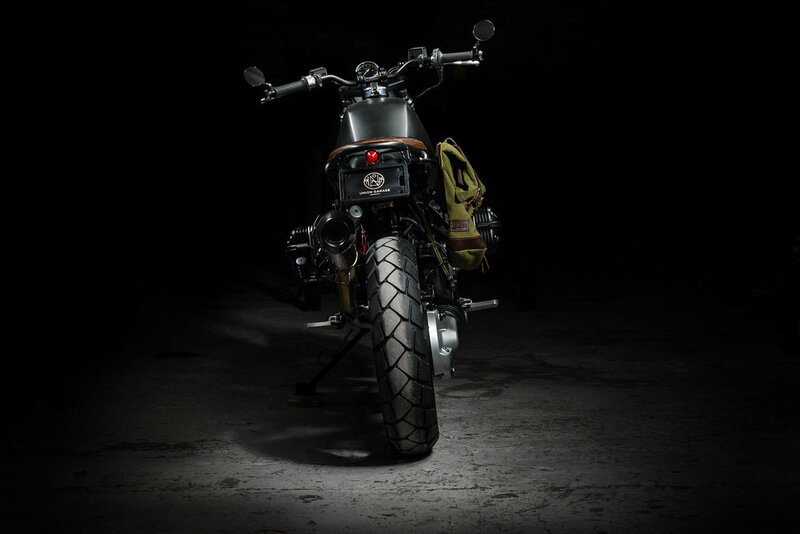 In the end, the bike turns out to be a total hooligan bike - the front wheel goes up with a little twist of the right hand and the light weight allows it to be hustled through tight corners far quicker than it should. So. Much. Fun. Whitcraft Services was the name of my grandfathers bus garage - he was the consummate tinkerer - a stand-out childhood memory involved having grandad visit and immediately plant himself in our backyard garage, emerging a day later with several ‘reconfigured’ big wheels - he cut all my worn out big wheels in half, salvaging the still usable front ends and bolting them together with the usable rears - these were some seriously weird creations. My cousins and I (as well as my Dad, Aunt and Uncle) all kind of hung around the bus garage on family visits. Vacations were about making the trip to granddad’s and ‘helping’ in the garage - pestering everyone who was busy with repairing school buses. The first ‘motorbike’ I had was a Dutch moped my dad scored at the police auction in Cleveland for $26. We got it home and commenced in perpetually dis- and re-assembling it, riding it around the city with my friends - an awesome experience for a kid. I started building these motorcycles after riding for years but not wrenching much. After a serious breakdown on an older BMW GS, I just dug into bikes seriously and haven’t seen a reason to stop yet.